Banking Soda has a ton of uses! Not just baking. I using it for scouring messes in the kitchen. Freshening up the litter box and laundry! I bought this 5 lb bag at Sam's Club for about $5. But check your local warehouse store such as Winco. 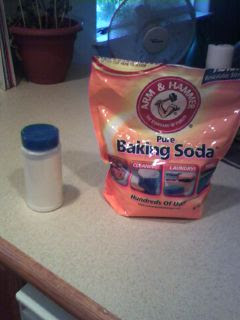 I can get bulk baking soda for about $.30/lb. So that is about 5 lbs for $1.50!! BIG savings! 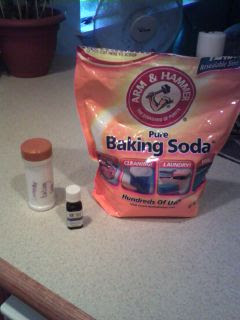 I re-used an old spice container and filled it with the baking soda. When you have a mess, such as stuck on food on pans or the counter just sprinkle on some baking soda spritz it with your vinegar/water mixture. Let sit and then wipe right off! I also use baking soda to freshen up the litter box. 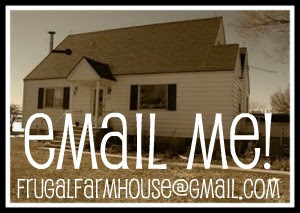 Fill it up with baking soda. drip in 10-15 drops lavender essential oils. Shake up. This truely smells amazing. I also use it as a carpet freshener. Sprinkle on the carpet. Vacuum up. Wala! 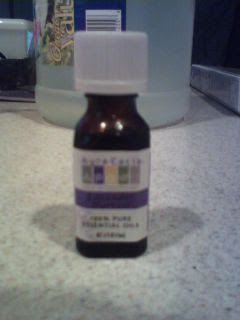 Lavender Essential Oil- purchase at any vitamin store. 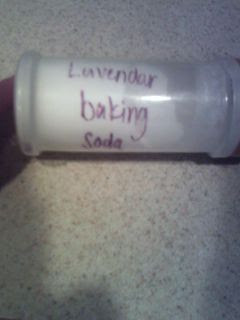 Always be sure to label your baking soda. This is not to be used as a baking ingredient! !